Six Weeks to Launching Like an Expert Even if You Don’t Know What to Launch or How to Do IT! But on the other hand I’d experience the “lows” because the prospect of launching it out into the marketplace seemed incredibly overwhelming. The easiest thing to do is to just make excuses and keep putting it off. It becomes a “some day” kind of project. But we both know that “some day” never rolls around on it’s own. If you don’t launch your “BIG IDEA” out into the world where others can benefit from it NOW, then WHEN will you do it? Do you want to be sitting in the same place next year? Do you really want to be on the sidelines watching your competitor get their version of YOUR product out there, instead? I’m guessing that if you’re reading this page it’s because you’re ready to step out of your comfort zone and do what it takes to get your great idea launched! You’re ready to learn the exact tools and get the support you need to take action and get your project completed and launched. Instead of beating yourself up for what you haven’t done in the past, imagine how amazing you’ll feel when you finally get your solution into the hands of your target market and lots of money flowing into your bank account. After a high-energy corporate career in the fashion industry, with the birth of my daughter I wanted the flexibility and freedom that only entrepreneurship could offer me. I became a serial entrepreneur and went about doing almost every kind of launch imaginable – my own clothing line, a membership program, online telesummit, coaching programs and info products. Some of my launches worked brilliantly and some of them flopped, but I was incredibly tenacious and this led to some exciting successes. In just one year I saw my list grow by over 500%, my web traffic tripled and I was on radio and TV. I was even on the Today Show! Even though I didn’t know it at the time, these experiences were preparing me for a big opportunity. Glazer-Kennedy (the key resource for small business owners to gain marketing knowledge) asked me to work as their Director of Special Projects. 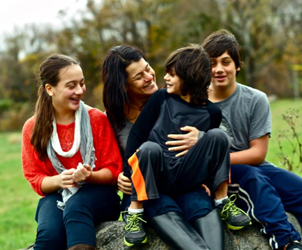 The timing felt right for me because at the time I was recently separated and living on my own with three kids and the promise of a regular paycheck – even for a die-hard entrepreneur like me – was very alluring. And the thought of working with Dan Kennedy and his amazing team of brilliant marketers was too good to pass up. So I jumped in, immersed myself back into corporate culture and over the next year and a half played a key role in launching their new women’s division, their first women’s event and three multimillion dollar product launches. I learned the ins-and-out of a very high-resource, fast-paced and highly systematic launch process. While I loved my corporate job, my entrepreneurial spirit was gently nudging me to return to my roots. But having outgrown my previous business model I was unsure of what direction to take. Needing some inspiration, I went to an event to meet and brainstorm with other business owners. I knew this would rejuvenate me and give me the creative spark I was after, and I was right. As the universe always orchestrates, the perfect person was sitting next to me… her name is Donna Cravotta. Donna was working on the content for a new Social Media PR program she wanted to launch quickly. She was realizing the enormity of her project from writing her program, to setting up the technical side, to managing a team to finally rolling out a marketing plan. Her brilliance was unmistakable as was her overwhelm. For me, it was love at first sight. Her energy and passion were contagious and I was so excited at the thought of how I could help her. Because what felt hard for her, was easy for me. From that first conversation I knew I was the person with the perfect skill set to help Donna. I knew the ins-and-out of creating products and of launching. 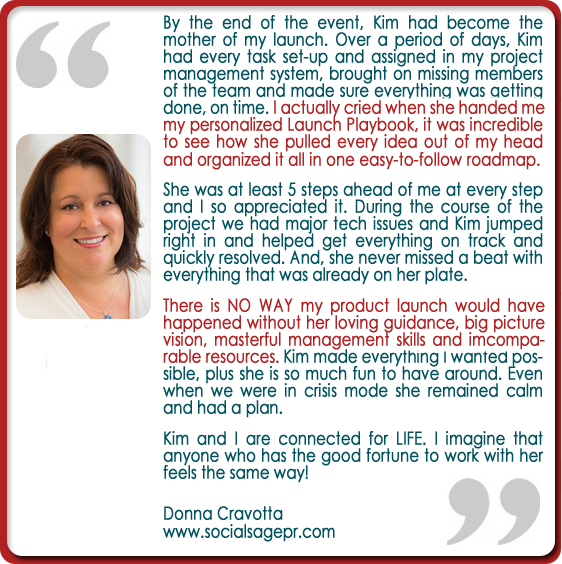 As much as Donna appreciated my help, I benefited in such a big and unexpected way from our experience. While working with Donna I got the clarity about what I’m meant to do. I’m meant to help women who have brilliant and creative energy to take their offerings and get them launched into the world where they can help the most people! Donna went from being a stressed-out, struggling to pay her bills, single mom entrepreneur to a confident business woman making six-figures because she had the confidence, the tools and the Playbook she needed to get her idea out of her head and into the marketplace. 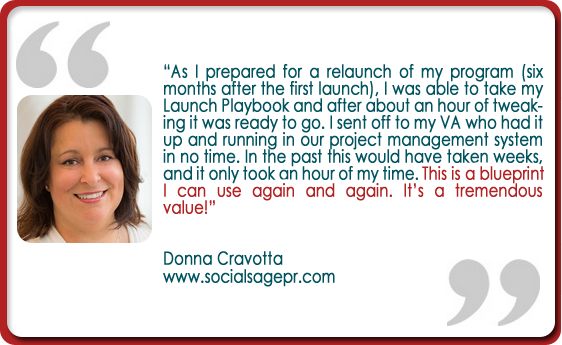 Are you ready to be like Donna and get your idea launched where it can serve your community and make you money? Then there are all the questions that you don’t even know you should be asking. There’s a lot you don’t know what you don’t know, and that’s frightening when you’re going out there in a big, new way with your launch. Now there are some launch gurus that will tell you that they have all the answers. 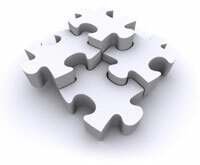 a cookie-cutter, one-size-fits-all approach just will NOT work. You need something much more dynamic than that because YOUR launch is different. I know that because I’ve seen how every launch is different – you have unique gifts, your own community, your specific goals and a vision of what you want to accomplish. If I gave you an already completed Playbook it wouldn’t help you much because it wouldn’t reflect you and your business and your goals. That personal element is what’s missing in many “Big Launch” systems. Instead, imagine having the specific guidance of someone who knows the process of creating and launching something new but who also knows YOU, believes in you and your idea and is in a position to help you identify the right answers and map them out. So instead of going with a highly masculine, formulaic approach to launching I created a program that encompasses a flexible, customized, tailored approach to your unique launch. 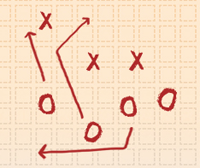 Throughout the program you’ll be creating your unique play-by-play Launch Playbook. This Playbook is the place where you’ll capture (and organize) every step of your launch. And even though you’re the one with the answers, I’m going to guide you to them. I’ve put in the time to become an expert at launching (they say it takes 10,000 hours, right?) both with my own launches and with managing several high-level million-dollar launches. And now you get to pull from everything I’ve learned. I’ve drawn on all of my experience and my strong sense of intuition to show you your various options, share with you the real pros and cons on each one and help you choose the direction that works best for you. I’ve mapped out all the planning, the steps and the shortcuts I’ve worked through countless times and I’m handing them over to you so you’re in an empowered place to create your own Playbook. Having this well-defined Playbook is going to give you CLARITY. Instead of having all those questions bouncing around in your head, never giving you peace, you’ll be led through my process so you have all the answers. When you get stuck, and you probably will, you’ll have the templates, resources, how-to videos and steps at your disposal, to give you the CONFIDENCE to finally make your vision a reality. You’ll have your purpose and the clarity of your mind. Instead of feeling unsure and a bit aimless, you’ll always know what you need to do next, one step at a time. And you’ll know exactly HOW to do it which seems to get left out a lot in life, doesn’t it? And there’s more. Having your own Playbook ensures that 100% of your team and even your supporters will be clear about the role they need to play. Whether it’s a team of one (you), a few or many, having your own Playbook will inspire innovation by clearly defining what each player from your web programmer, to your graphic designer, to your VA, etc. has to accomplish. The Playbook is going to be your personal roadmap that will guide you daily and ensure you stay on track. So let me share with you how this program works. 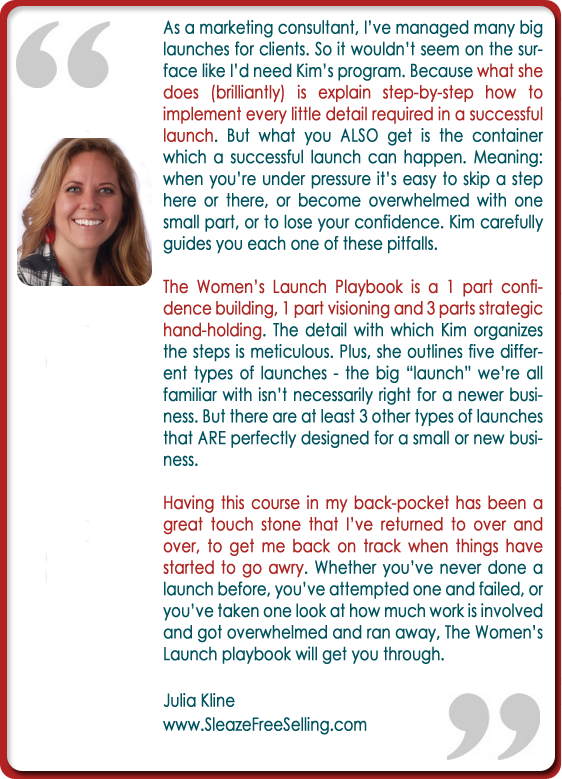 The Women’s Launch Playbook is broken into 6-modules to help you progressively complete your offering and prepare for your launch. As you’re creating your own customized Playbook with all the steps you need to take, you’ll also have me access to me for when you have questions along the way. Here's a sneak peek into the members area so you can check out all the "how-to" content. WHY you want to launch something new so you’re clear how you measure success. WHY you’re the best person to do it so you STAND out, even in a crowded market. WHO is your launch designed for and WHY do they need it so you create a solution they can’t wait to pay you for. WHAT kind of info product, event or program will be the best match for your business so it accomplishes the BIGGER goals you have for your business and gets you there faster. HOW to get it out of your head and into your Playbook with my favorite mind-mapping tools to organize the main tasks involved in your launch. HOW to use my Bucket System to break your project into smaller “bite size” pieces so you can make it more doable and less overwhelming. HOW to keep on top of each phase of your project by having it carefully delineated with all the corresponding steps. HOW to take the steps you broke down and sequence them into a logical order so you can see WHAT you need to be doing at any given time. WHO should be doing WHAT so you have a team on board to support you throughout the entire launch process? HOW to price your product and have a service mindset so you can confidently communicate your launch offering as a MUST HAVE for your target market. WHICH of the many launch channels will work best for your product offering so your launch quickly grabs the attention of your target market. HOW to communicate with your affiliates, prospects and customers with an amazing email map so you don’t get bogged down in a tangled web of email communication. WHAT launch style works for your business. Examine different launch channels – such as the evergreen and buzz-worthy launch – so you can determine the most effective launch techniques that will connect you with your target market. HOW to create an authentic, yet incredibly effective sales page that really connects with your prospects so they feel like you understand them and can help them so they’re compelled to look to you for the solution to their problem. It’s time to maximize your exposure from your launch and use it to leverage your the relationship you have with your new customer by planning…. HOW to create a dynamic, progressive marketing funnel so your launch becomes a stepping stone to growing your business to a new level. WHAT kind of upsells (and downsells) make the most sense post-launch so you give your clients even more value and you benefit by being the go-to person for providing them with options. 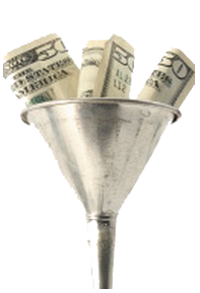 HOW to use the “trigger offer” a special teaser concept to support your new prospects to join you as a customer. After just six weeks of coaching you’ll be ready to launch like an expert, because you’ll have your own Personal Launch Playbook (with ALL the answers) at your fingertips. You can use it again and again for different launches! The template you’ll use has the flexibility built into it for you to tweak it for any kind of future launch. This is a long-term investment that will provide you with a return over and over again. That’s what happened to Donna Cravotta (the inspiration behind this program). Here’s how she took advantage of her Playbook for another launch. The fantastic content you’ll be learning in this program will only benefit you if you implement it! To get the support and the accountability you need to get it done in your business you’re getting lifetime membership to my private Action Club group on Facebook. Post feedback and questions for me. Network with other participants who are going on this journey with you and gain additional “Get It Done” insight. Chart your progress for immediate feedback and support. 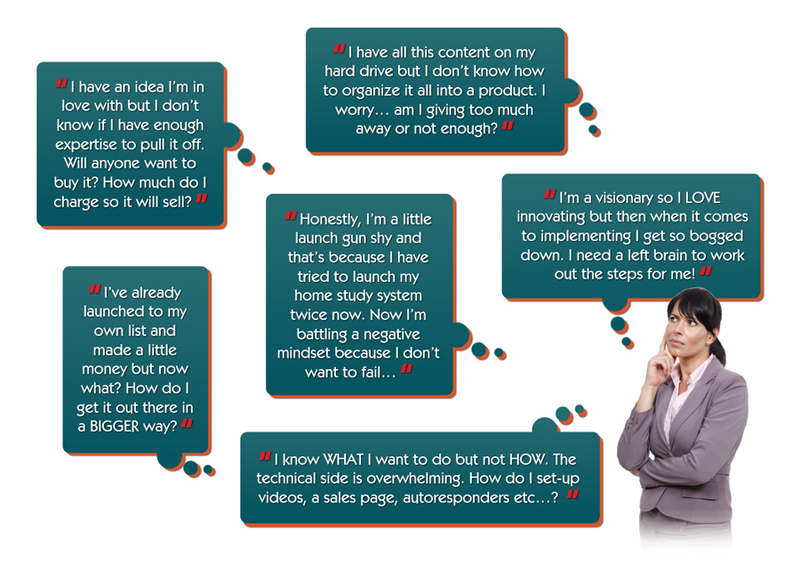 Are You Committed to Doing What It Takes to Launch Successfully? If so, then I would love to give you the tools you need to succeed. Going it alone is a hard, and challenging road. 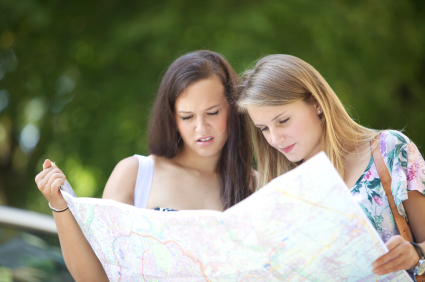 And frankly having been on that road alone myself, it’s not a results-oriented approach. It’s better to have the support of a group of like-minded entrepreneurs. It’s better to have a Playbook with every step outlined ahead of time. It’s better to have a mentor who has the experience and the personal desire to see you succeed. Your personalized Launch Playbook gives you every step, tool and strategy you need to get your idea launched, generate income and feel great knowing you’re making a difference and serving your client. Offering this program is amazing because, for me, there’s no bigger thrill than seeing your brilliant programs and products get out into the marketplace. 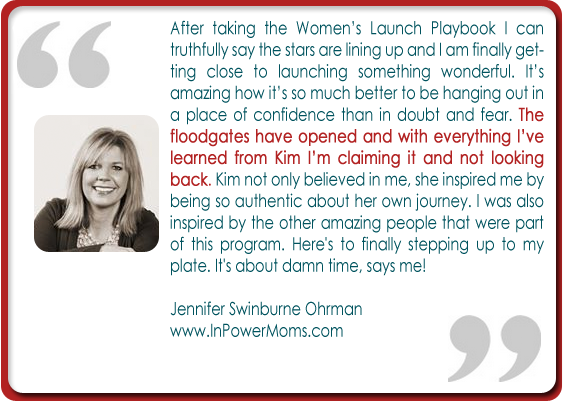 The Women’s Launch Playbook allows me to mentor so many more women the same way that I helped Donna. And the truth is, I charge a lot to manage a launch, but this program is not about me being a manager, it’s about me mentoring you to be successful on your own. It’s important for me to make it easy for you to get your brilliant offerings out into the marketplace so I made the investment in this program reasonably-priced while providing the highest value. If you’re reading this page it’s because you really do want to launch successfully. It’s time to make a solid investment in yourself and your business and make that happen. The great thing about this particular investment is that it will last you a lifetime. You’re investing in a tool that you can use repeatedly for any and all your future launches. I provide you with two options for how to proceed with this program. 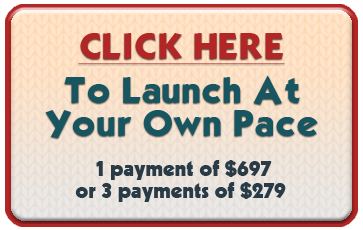 You can either launch at your own pace and invest $697 or you can fast track your results with one-on-one coaching with me and receive strategic accountability and support for the investment of $997. And to make it easier and affordable you can invest in either option with an easy 3-pay plan. Kim, will this work for me? I haven’t even created my product yet and I have no idea about launching at all. Yes, beginners can definitely benefit from this program. I will coach you through the creation phase of your product and then share all the systems and steps on how to get it launched. I see all these big launches out there, and those scare me, are there other less-intimidating launch options? 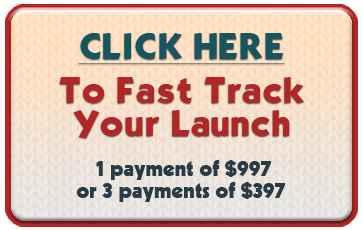 This program is very scalable so you can keep your launch relatively small or go really big – either way I teach you about 5 different launch channels and you can map out those tools in your customized Playbook. I feel like I already know – more or less – what I should do to get my project done BUT I keep procrastinating… Can you really help me get over my tendency to procrastinate? During this program you’ll figure out if there is an underlying reason for your procrastination, so you can address it head on. Rarely is procrastination due to laziness, it’s often fear-based, and I can support you to get to the bottom of that fear. Once you have the tools, the coaching and the accountability you’ll be amazed at the momentum you are able to generate. I’m completely right brain, very visionary and not great at implementing. How can you help me? Entrepreneurs tend to be visionaries or “big picture” thinkers which is what makes them successful. The beauty of this program is I map out all the steps, give you the left-brain tools, which have typically felt very illusive to you and make the details “painless.” You’ll have all the steps in your playbook allowing for delegation and implementation to be so much easier! The idea of selling myself and my stuff gets me stuck, any ideas? This is something that we’ll address right away. You’ll learn how to approach your launch with an attitude of service to your ideal client. This removes the pressure from you and allows you to sell with grace and ease. 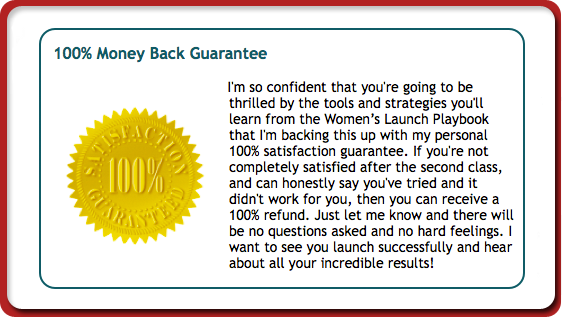 I’d like to launch an event, instead of creating a product or program, will the Women’s Launch Playbook work for me? Yes! I will provide specific advice on launching an event or a program. This Playbook is very adaptable to whatever kind of launch you have in mind. When I think of launching I get very overwhelmed, it seems there are so many moving pieces, how can you help? 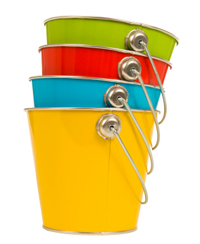 You’re going to love the step-by-step coaching you’ll get along the way and my “bucket system” and scheduling template that makes it easy to keep track of all the moving pieces. And don’t forget you have access to my support if you do get stuck. Is this program exclusive to women? No. I have men who’ve received a lot of value from this program. However, the majority of participants are women so if you’re the kind of guy who can keep up with us then please join us! Sound good? Then register below and let’s get started! Yes! 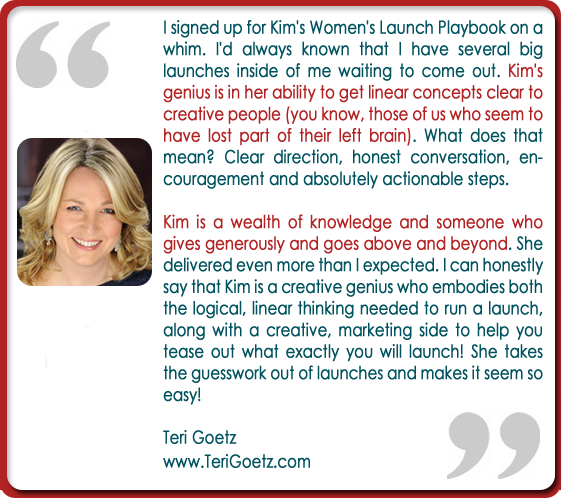 Kim I want to join The Women’s Launch Playbook so I can be TOTALLY Prepared for a successful launch! Six Coaching Modules via how-to and behind-the-scenes webinar trainings and worksheets, templates and exercises to help me prepare for each phase of my launch. 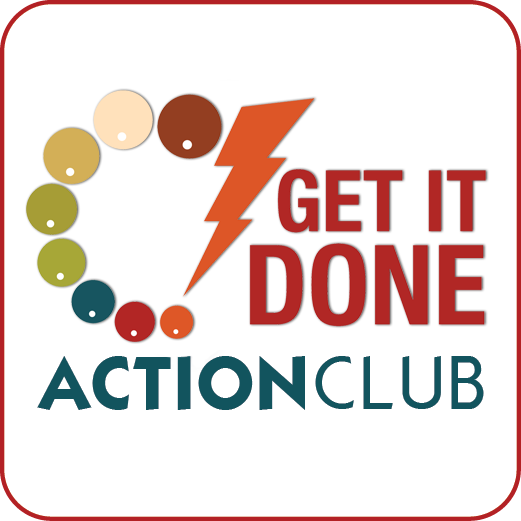 LIFETIME Membership to the Get It Done Action Club – My ticket to Online Support and Accountability so I can ask Kim questions and connect with like-minded entrepreneurs. Bonus Mindset Coaching Module for additional training on how to overcome the biggest mindset challenges to my launching. PLUS! Get It Launched Coaching Session. 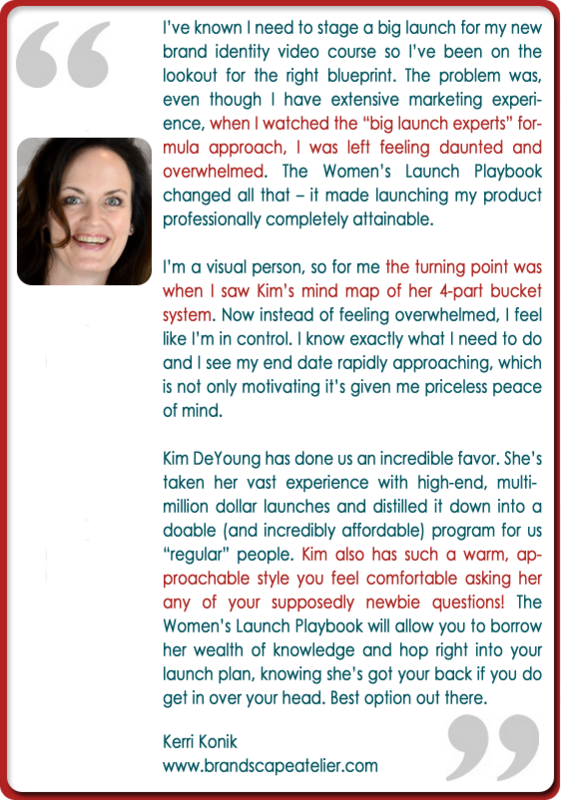 In this 60-minute session Kim will help me strategize my launch by identifying which of the five launch channels will work best, give me advice on what to delegate and provide implementation-focused suggestions to get the most from my Launch Playbook. PLUS! Direct email access to Kim for 30 days so that I can ask questions and get advice “on the fly” as I need it. Plus I’m covered by Kim’s 100% Satisfaction Guarantee! I’m really looking forward to mentoring you through your launch! Imagine how great you’ll feel as you get your offerings out into the world and you’re helping more people and watching your bank account grow. P.S. Are you ready to go for it? Nothing will keep you from realizing your goals faster than delaying decisions. So it’s time to take action and decide if you’re ready to get the coaching and tools you need to launch. You’re covered by my guarantee so you don’t have anything to lose, sign-up now, and let’s get to work!